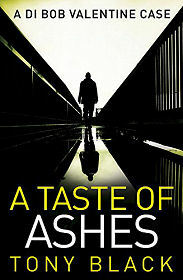 "A Taste of Ashes" is Tony Black's second outing for Detective Inspector Bob Valentine, and a darkly entertaining and splendidly gritty read it is. The detective has largely recovered, physically at least, from an incident in which he was stabbed through the heart, needed 50 pints of blood, and declared clinically dead. The mental scars continue to haunt him, though, and a call to a fatal stabbing in a house in one of Ayr's less salubrious areas brings Bob face to face once more with the reality of what happened to him. We are used to lead characters in Tartan noir novels having dysfunctional private lives. Bob Valentine remains something of an exception, having a loving wife and two daughters who mean everything to him. For how much longer seems open to debate, however. His wife has had enough of a marriage in which she and the girls always come second to Bob's work, and his brush with death has only heightened her concern and lowered her willingness to tolerate his total commitment to the police. If Bob's marriage continues to survive, however shakily, his professional relationship with his boss, Chief Superintendent Marion Martin, has reached a point of near total meltdown. And to add to his problems, Bob continues to experience supernatural visions of dead people who are trying to communicate with him. Against this background we follow Bob's efforts, aided by Detective Sergeant Sylvia McCormack and the rest of his team, to find out who killed the stabbed man, James Tulloch, and why. Things are not helped by the disappearance of the dead man's partner and her teenage daughter, or by the death of a neighbour who might have witnessed what happened. But slowly and painfully the pieces begin to come together, and it becomes clear that there is far more to what seems a simple domestic murder than initially met the eye. Why are the Army taking such an interest in the investigation? What are the links with a robbery at a club owned by a local gangster? The strands come together to form a highly satisfying conclusion that surprises as much as it entertains. The town of Ayr features large in the book, though it's a rather grimmer portrayal of the place than usually appears in the tourist literature. As a result this may not be the right novel for you if you have just booked a week's holiday in Ayr, but it is highly recommended for everyone else.